Muhammad Aurangzeb Ahmad is an Affiliate Associate Professor in the Department of Computer Science at University of Washington and a visiting research scientist at the Indian Institute of Technology Kanpur. He is also Senior Data Scientist at Groupon. Prior to these engagements he was an Associate Researcher in the Department of Computer Science and Center for Cognitive Science at the University of Minnesota where he did his PhD. He has been fascinated by Science Fiction since his childhood and greatly appreciates the use of Science Fiction to illuminate relationship among people and the relationship between technology and humankind. He also edited the first anthology of short Science Fiction stories on Islam and Science Fiction in 2008 with Ahmed A. Khan titled “A Mosque Amongst the Stars.” He started this website in 2005 to address a glaring gap in literature on this subject. Gwen Bellinger is a writer and consultant currently working with the Indian government’s Department of Education. In 2015, she completed her M.A. in Middle Eastern Studies from the University of Chicago, focusing on Islamic finance, the Gulf aviation industry, and Arabic. She has experience writing for travel companies, English language courses, and academically in the fields of economics and history. Originally from North Carolina, Gwen obtained a B.A. in History from the University of North Carolina- Chapel Hill in 2012. Mohamed Bhimji works as a Director of Customer Operations in Vancouver, BC Canada and has a strong background in Information Technology and an immense fascination with science fiction. He has been a fan of science fiction since he can remember having read the greats and the up-and-coming writers. His draw to science fiction has been to see where technology can ultimately take mankind, how technology and science can be used to create a better world today and for generations to come. Science fiction also allows him to dream of a time when we may be able to travel to distant parts of the galaxy and universe. Over the last few years being introduced to Islam and Science Fiction have taken on a new meaning – not only how technology and science can improve our lives but how religion and Islam in particular fits into the world beyond today. Marianne Edwards is the love-child of two writers, so although she has written poems and stories all her life, she also has a proper job as an osteopath. She has a passion for bond-based horsemanship and doesn’t believe in magical thinking or telling people what to wear and who to love. She is an intersectional feminist. Osteopathy enabled her to live and work in Germany, Costa Rica, Hong Kong Kong, the UK, and France. The balance between writer and therapist has not been easily won, and when teaching osteopathy and seeing patients took over, a trek to the southern coast of Spain provided a reboot. After nine months on the road with a tent, a dog and a donkey, she worked nights as a news editor, summarizing articles. That job opened her eyes to the malign power of print media but it was also where she met her amazing husband, horror writer Dean Clayton Edwards. They live in France with their two children, dog, chickens, and rescue ponies. She continues to write poetry, short stories, children’s fiction, radio dramas, and see a few patients, while also working on a novel about a photographer and a feral child. Ethics allowing, she will write any non-fiction she is paid to produce – including re-writes, and critical feedback. Her writing has appeared on numerous blogs and websites and has had thousands of views on Scriggler. Recent work includes twenty articles for The Canary and fiction for The Pigeonhole. She has a minimalist website. Rebecca Hankins is an Associate Professor, certified archivist/librarian at Texas A&M University, College Station TX. Her previous employment included 12 years as senior archivist at The Amistad Research Center at Tulane University in New Orleans, the premier research repository on Africana historical documentation, and two years as Assistant Librarian at University of Arizona Library, Special Collection; Tucson, Arizona. Her expertise includes building collections and scholarly resources for the study of the African Diaspora, Race & Ethnic Studies, and Arabic Language and Culture. She has published in library and archival peer-reviewed journals and her latest publication is on Islamic science fiction and fantasy in the international journal Foundation: The International of Review of Science Fiction out of the UK. She joined this project in 2010. Josh Hicken is a Software Engineer whose writing background is primarily in journalism, having served as both a staff writer and an editor for the Chaffey College newspaper, The Breeze. He inherited a love for science fiction from both of his parents: hard sci-fi from his father, and all things post-apocalyptic from his mother. As a relatively new Muslim, he enjoys using writing as a medium for exploring the intersections of Islam and science fiction. Areeba Nasir is the author of a novel “No Exit” based on the human rights violation in India occupied Kashmir. She pursued her Masters in English Literature from Delhi University and Master’s in Islamic Studies from Jamia Milia Islamia, India. She has also written a couple of short stories. Recently her short story “In the name of honor” based on honor killings in India, was published in Indian Review, an Indian magazine. Areeba believes writing should be such that brings about a change in the society. Areeba always chooses social taboos and issues prevailing in societies as themes of her stories. Currently she is working on her second novel. Dr. Ahmed Naumaan has extensive experience working in academia and industry in positions of leadership. He served as Dean for colleges of engineering and technology at several for-profit universities. He also taught software engineering the University of Minnesota – Twin Cities, Computer Science & Engineering Department. He worked in industry on managing product development and projects in automated meter reading systems, communication devices, and information technology, as well as conducting research on solid-state sensors and integrated optical devices. Naumaan is also active in community volunteer activities and has served on the Boards of several non- profit organizations. He has written and directed plays for performed at the Minnesota Fringe festival. He co-hosts a program of South Asian music on KFAI radio on which he plays Pakistani music. He has also produced news, interviews, and documentaries for radio broadcast. He has produced translations of Urdu news articles into English for Watching America. Dr. Naumaan has multiple publications and conference presentations and two patents. His current interests are in the areas of software engineering, big data, cybersecurity, and engineering education. Naumaan received his PhD and MS in Electrical Engineering from the University of Cincinnati, and his BE in Electronics from the University of Karachi. Nahida S. Nisa writes about disruption. Her work explores power dynamics, upheavals, and the ramifications of trauma. She problematizes the circumstances in which individuals are situated and suggests subversive resolutions. In science fiction, she explores the various architectures of societal oppressions in destabilized settings. Scifi facilities the discourse of her revolution. Nahida’s interests include international relations, Quranic exegeses, music theory, dancing, wandering off, being stubborn, setting ambitious goals, and challenging the patriarchy. Deka Omar is a PhD candidate presently working on her doctoral degree in Sociology. Her main area of expertise is political sociology with a keen interest on Political Islam, and Khaldunian theory of state formation. As a proud member of the Geek demographic, and a lifelong Trekkie, she also enjoys writing about a wide scope of topics ranging from politics, to literature, and all things geek related. Nicholas Nasr Pierce converted to Islam in 2008. He is a third year law student at Loyola University, and an itinerant writer of prose living in Uptown, New Orleans. He has published numerous nonfiction pieces for The Daily Reveille, Morocco Tomorrow, the Huffington Post, and others. In 2014 he received an Associated Press Award for a column on the Boston Marathon Bombing. His first short story, The Silent Man, was published by Akashic Books in 2015. Originally from Baton Rouge, Nick holds a Bachelors in History from Louisiana State University. Saqib Sadiq teaches literature at a local Islamic school. He emphasizes leisure reading to his students, a lost art in the digital age. A geek at heart he practices what he preaches and is often found nose deep in a good book. The genre of which is usually Science Fiction. After years of reading from the sidelines, he decided to try his luck at writing. The fruits of which can be found on his website. He has also grown fascinated with Geek culture intersecting with Muslim culture. And so he curates a growing list of stories and characters on his Facebook page. The unique feature of which is SF stories with Muslim Heroes. When not teaching, reading or writing Saqib also consults as a Business Analyst. 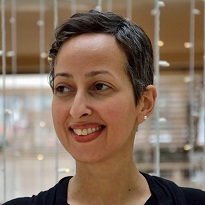 Sofia Samatar is a Professor at California State University. She was nominated for a Hugo Award in 2014. Previously she was PhD student in African Languages and Literature at the University of Wisconsin-Madison, where she specialized in twentieth-century Egyptian and Sudanese literatures. Her poetry has appeared in Stone Telling, and her debut novel, A Stranger in Olondria, was published from Small Beer Press in 2012. She blogs about books and other wonders at sofiasamatar.blogspot.com. This is a list of people who are not part of the editorial team but who have made important contributions to the project. Hal W. Hall is a retired librarian and legendary bibliographer of Science Fiction whose career spanned more than 50 years. His Science Fiction Research Index is considered to be one of the foremost bibliographers of Science Fiction literature. In 2000 he was awarded the Science Fiction Research Association (SFRA) ‘s Pilgrim Award. Later in 2009, he was awarded by the SFRA Thomas D Clareson Award Award. His Science Fiction and Fantasy Research Index contains more than 89,000 entries on the subject. Editor’s Note: We are greatly thankful to Hal W. Hall who has greatly helped in making this project a success and giving up many wonderful suggestions on what materials to add.